Italians living in the Veneto region could soon get their own Putin. No, the Russian president has not suddenly decided to downshift and change countries. This Putin is a glamorous local political upstart. 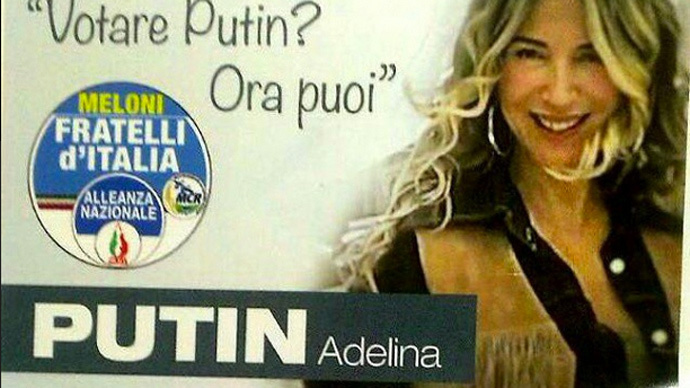 Adelina Putin is a radio personality and disc jockey planning to take part in the local council elections next week. She represents the right-wing party Brothers of Italy. She also claims to be Vladimir Putin’s cousin. “We are distant cousins,” she told Italy’s Raid Radio2. “I’ve always loved my surname, but I’ve liked it even more since Vladimir came on the scene. My relatives and I have discovered lots of links with him,” she said in an interview with Il Giornale. Whether relatives or namesakes, the two do share some similarities. Vladimir Putin is often seen with a gun at firing ranges or firearms exhibitions, and Adelina’s social media pages are filled with photographs of her wielding pistols, assault weapons, and sniper rifles. Both also like to show-off their athleticism. Vladimir Putin is a black belt judo master and is also known for photographs of him swimming, fishing or horseback riding sans shirt. Adelina is a bodybuilder, and never too shy to take a bikini snap. Unlike the Russian president, however, she is tattooed all over.